Digital transformation and its associated technologies – collaborative robots in particular – are generating enormous interest in manufacturing. Industry 4.0 will have a strong impact in the coming years in Africa, especially in the South African manufacturing industry. Scratch the surface and behind the enthusiasm generated by the technological developments lie issues for society concerning the impact and effects of this digital transformation. South African industry needs to find ways of adapting and using the technologies driving the fourth industrial revolution to remain globally competitive, yet maintain and create jobs in a high unemployment environment. Industry 4.0 will influence the conditions of and requirements for employees in many areas. 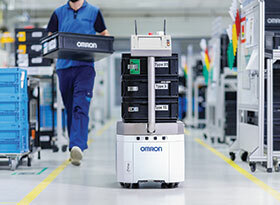 Driven by the application of machine-to-machine communication and an increase in the realisation of autonomous systems, the demand for qualified production controllers and managers has increased, but the demands placed on workers themselves can be reduced. The impact on the general situation of workers and unskilled labour can be positive. On the other hand, their skilled counterparts will have to come to terms with growing pressure on performance and skills. Industry 4.0 and the digitisation of our day-to-day lives are bringing many improvements in their wake. The increased efficiency, improvements in productivity and new services will change our society, behaviour and the corporate landscape. The transformation will mean that countries that promote digitisation will be able to defend and build on their competitive position. The change to a digital society will take place over the next 20 to 35 years. The availability of digital infrastructure, an increase in the availability of data sources and a requirement for the efficiency of services and algorithms, in line with Moore’s Law, are the prerequisites for the change to a digital society. The effects of Industry 4.0 and the further use of robotics in the world of work are many and various, and are influenced by the availability of infrastructure in a company, as well as by digital investment strategies and cooperation between social partners. Digital transformation will change the demand for skills. More highly skilled workers with an understanding of complex relationships will be required. The knowledge surrounding these relationships will become obsolete more quickly as technology continues to develop, and will constantly have to be kept up-to-date. Society will experience a new and greater dependency on up-to-date knowledge, while at the same time processes considered monotonous and irksome will be eliminated as machines become capable of making decisions autonomously. In some cases even specialist workers will no longer be required in a production environment, and it is also possible that Industry 4.0 could bring about ‘technological unemployment’ among both specialist personnel and their lower-skilled counterparts. Marques concludes that as South Africans, we need to start at grassroots and foster an interest in the sciences at primary and secondary level. As for industry, all the relevant stakeholders need to familiarise themselves with the concepts of Industry 4.0 and the benefits and value that this technological revolution can bring. Integration and service providers need to ensure that they are always ready to implement the latest innovations – those who do not, simply will not survive.